Those born between November 22nd and December 21st are born under the star sign Sagittarius, depicted as the archer. Read on to find out more about this prominent zodiac sign. Optimistic, impatient, honest, critical, inspirational, indulgent, adventuress, restless, spontaneous, tactless. Most interpretations conclude that the mythology of the Sagittarius Star Sign relates to the story of Chiron the centaur, accidentally shot with a poison arrow by Hercules. It is thought that Chiron changed himself into a horse to escape his jealous wife Rhea. Chiron was renowned for his gentleness and kindness so in recognition of this, Jupiter placed him in the sky as the constellation Sagittarius. Ancient drawings and images of Sagittarius have been found dating back to the Assyrians and Babylonians. Enthusiastic, independent and outspoken, Sagittarians are said to be the most fun-loving people in the zodiac. They rarely tell lies and are open with their feelings and opinions, no matter how undiplomatic. The Sagittarius is the traveller of the zodiac and their energy draws them to explore and search for new places and experiences. A great sense of adventure and a well-developed imagination make Sagittarius enthusiastic and creative. They like to both seize opportunities as well as initiate projects. They seem to have a sixth sense for people in trouble, they will always fight to help those they see as the ‘underdog’. 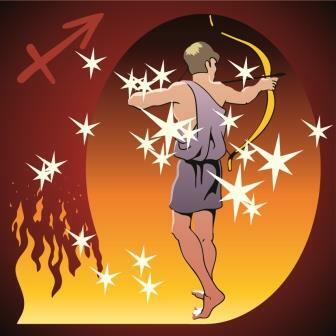 Sagittarius is a fire sign; their quick temper often gets them into trouble and they can speak without thinking. Because of their need for travel and adventure they can often get bored or restless when they are surrounded by people or situation’s they have no interest in. This can make them come across as emotionally detached or unaware of others feelings. Sagittarians have keen, inquisitive minds. They are fast learners and profound thinkers and often work well with others. They can be counted on in the workplace because of their excellent intuition – they can tell straight away if an idea is a good one or not. This is a versatile sign, and is quite capable of doing many things at once – in fact they will relish the opportunity to do many tasks, to stem off boredom. They like a challenge, and dull routine jobs will tire them. The Sagittarius sign is good at the big picture, but it is helpful to have someone on the team that can look to the small details. They are very good at sales and promoting. They have good empathy and so can work well within a team, as long as others can overlook their tendency to be blunt. They don’t mean any harm by it – they are just very straightforward and think others are the same. Love is all about the adventure, love moves fast for the Sagittarius sign, if you can throw in something exotic like love in a foreign land – you will really have captivated them. This sign is happy by nature, but even more so when they feel loved. For a relationship to work it is essential that they are compatible on an intellectual basis. Their partner needs to be generous of spirit and good humour is a must. It can be hard to tie a Sagittarius sign down, they always want to feel like they are ‘free to move’, they need honesty, security, amusement and inventiveness to consider a long-term relationship. The thing most likely to make Sagittarius move on is jealousy from their partner. If they do not feel fully trusted, cracks will begin quickly. Sagittarius have the ability to be with only one person, if they think about cheating it is likely that the relationship is being taken for granted – they feel no excitement and things are just too routine. As children Sagittarius signs never sit still, they are the child constantly asking enquiring questions. They are enthusiastic, happy and a little mischievous – but they will be honest and own up to wrongs if pushed. It’s important that Sagittarius children are given room to express themselves, they don’t mind education as long as an element of self-expression is permitted. They can develop a sense of responsibility early on, when trusted with tasks, pets or people. As parents, Sagittarians believe that education comes from all sources, school, museum visits, nature, and travel. They will actively encourage pushing Sagittarius outside of their comfort boundaries and exploration is the name of the game. They are not great at laying down a routine, and so discipline can be a bit haphazard. Due to their positive and encouraging nature, Sagittarians make great friends that will do anything to make those around them feel happy. Their kindness is selfless and they often treat people how they would expect to be treated. Easy-going, with a good sense of humour, Sagittarians make friends with people from all walks of life. Born entertainers with no shortage of ideas it is no surprise that many stars are born under the sign of Sagittarius. Research has shown that Sagittarians are more likely to reach success at a young age, demonstrated by celebrity child stars Britney Spears, Christina Aguilera and Miley Cyrus. Their ambition and drive make them a recipe for success in the cutthroat world of showbiz. Other Sagittarian success stories include Walt Disney, Steven Spielberg and Brad Pitt. The date of your birth has long held significance for your future life with many astrologists using this information to see how the stars and planets will influence us throughout our lives. If you are born under the Sagittarius Star Sign and want to find out more, contact one of our Psychic Readers today! Don’t forget to check back monthly to read your FREE Horoscope. You can also find out the different Star Signs that are compatible with Sagittarius.